Mary Parsons cooly rolled in her 6th birdie putt of the day on the par 5 18th and final hole of the tournament at Big Sky Golf Club on Friday to put the finishing touches on her 6-shot victory in the 2016 BC Junior Girls Championship. Parsons finished at even par (288) for the 4 rounds. Finishing tied for 2nd were Tiffany Kong and Hannah Lee, with halfway mark leader Sumie Francois coming in 4th and 13-year old Akari Hayashi rounding out the top 5. The win wasn’t without it’s up downs along the way, but Parsons’ perseverance proved to be the difference in the end. Each time she faced any adversity Parsons was able to refocus quickly and invariably make another birdie to get herself back on track. In round one she stemmed the damage from making bogey, double-bogey on the 7th and 8th holes with a birdie on the 9th to rescue her opening nine and proceeded to finish 2-under on the back nine. She offset 3 bogies with 4 birdies in round two and probably did her best work of the event in Thursday’s third round where her front nine was fraught with potential disaster as every bad break possible seemed to challenge her. After posting a 4-over 40 on the outward nine, which included a double-bogey 6 on the par 4 6th, followed of course by a birdie on the 7th, she then took on the howling wind and rain that showed up during the back nine. Her 2-under 34 coming home in that 3rd round staked her to the 2-shot lead she would take into the final round and eventually stretch to the 6-shot win. Of course she couldn’t go through that final round without some sort of bumps in the road to navigate. First, it came in the form of the par 5 4th hole where, having made a birdie on the preceding par 3 and with her lead now up to 3 shots, she was looking to put even more distance between herself and her closest pursuer, Tiffany Kong. It didn’t exactly work out that way, as she explains, “My alignment was a little bit off starting the round, so when I was going to hit my approach to the second landing patch in front of the green, (on the 4th) I was looking at my feet and I looked up and thought,’hmmm…that tree looks a little bit close…,” she began in recounting her 4th hole adventure. “But I decided to hit it, ended up hitting the tree. Then I thought, ‘hey, let’s just get through this hole’. Hit it into the bunker… duffed it out of the bunker…so I thought ‘let’s just take it and go.’ ” What she took was an 8 on the hole and suddenly found herself in a tie for the lead with Kong. But wouldn’t you know it…she made a birdie on the very next hole at the par 3 5th, giving her back a one-shot lead. 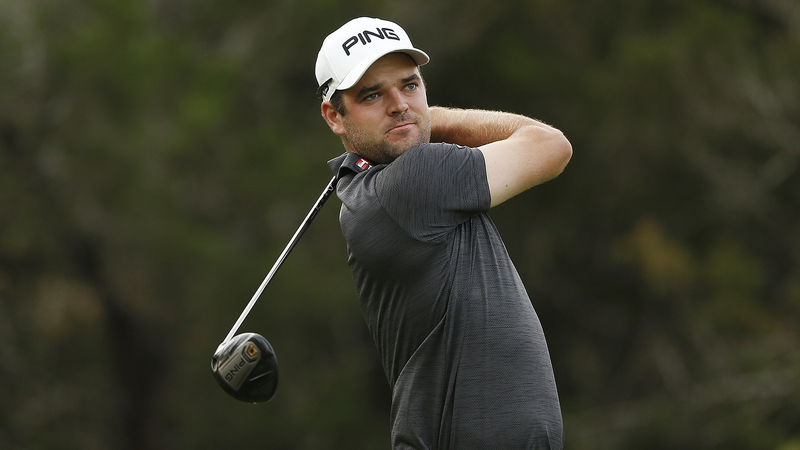 Over the next four holes Parsons would add two more birdies while Kong played them in 2-over par. Suddenly from having lost her 3-shot lead on one hole she completely turned it around to take a five-shot advantage into the final 9 holes. 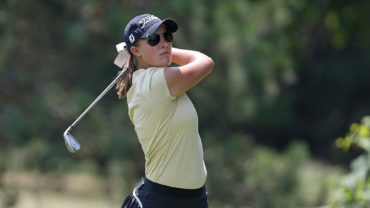 With neither Kong nor third place contender Hannah Lee seemingly able to mount anything of a charge on the back nine, Parsons appeared poised to cruise to the win. Not so fast…just to try and make things interesting she hit the ball out-of-bounds on the par 5 13th leading to a bogey. Lo and behold, she birdied the very next hole once more to regain her comfortable lead. Parsons, who plays out of Mayfair Lakes in Richmond, recorded a total of 17 birdies over the 4 rounds. This win is the second significant victory of her 2016 season following the one she picked up in the CN Future Links Pacific Championship in Kamloops earlier this summer. She had commented after that win, against a field that included many of the top juniors in the country, that she felt it was going to be a confidence-booster for the rest of the summer. 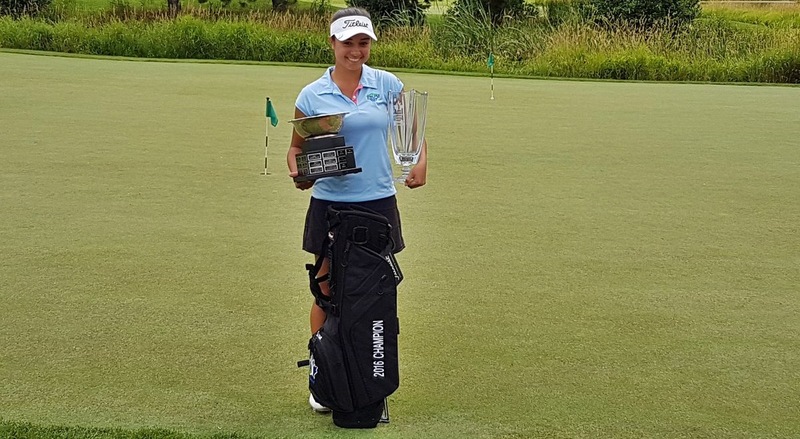 It certainly seems to have been so far, with this triumph coming just one week after she took runner-up honours in the BC Women’s Amateur at Beach Grove. The win should be a big boost toward Parsons achieving one of her big goals this year, making one of Golf Canada’s national teams. Parsons has already committed to Indiana University, where in the fall of 2017 she will join West Vancouver’s Alix Kong as a Hoosier. Joining Parsons on the BC Junior Girls Team going to the Canadian Junior Girls Championship at The Links at Penn Hills in Shubenacadie, Nova Scotia will be Vancouver’s Tiffany Kong and Surrey’s Hannah Lee. The 2016 venue for the BC Junior Girls Championship is TBD.